We returned over a fortnight ago, but I’m still a bit stuck for conclusions about Berlin. 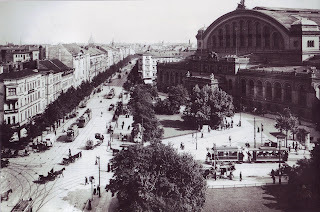 We all know more about the recent history of this capital city than any other (and if there’s anything you need to brush up on, every Berlin street corner has a helpful noticeboard or diagram to explain what happened, when and where), which makes it difficult to experience Berlin in the here-and-now. Wherever you stand, you feel compelled to think “what did this place look like in 1989?” or “am I in East Berlin or West Berlin?” It wears its history with some pride (we came through all this and survived), but you wonder if Berliners view it as something of a millstone round their neck. As someone who cannot get enough side-by-side, then-and-now photos of urban life, I guess I found Berlin seductive but resistable. Maybe I’ll post more substantially in due course, maybe not, but in the meantime, here is a little photobook of highlights. Each day, the Raspberry and I left our flat armed with itineraries and lists of buildings to look at. I’ll get onto the buildings later (many of them left me rather cold), but this one called out to me from nowhere. It’s near the Hackescher Market and I still don’t get it – how did that rather classical looking collonadey thing get to be cut out of an International Style curved corner? I can’t find anything on the internet, and it’s probably not really important, but it intrigued/s me. Norman Foster’s dome was closed, so we didn’t go into the Reichstag. The Platz der Republik felt a bit like a festival, but without the beer and homegrown – the architecture obviously has the same effect of dulling the senses. 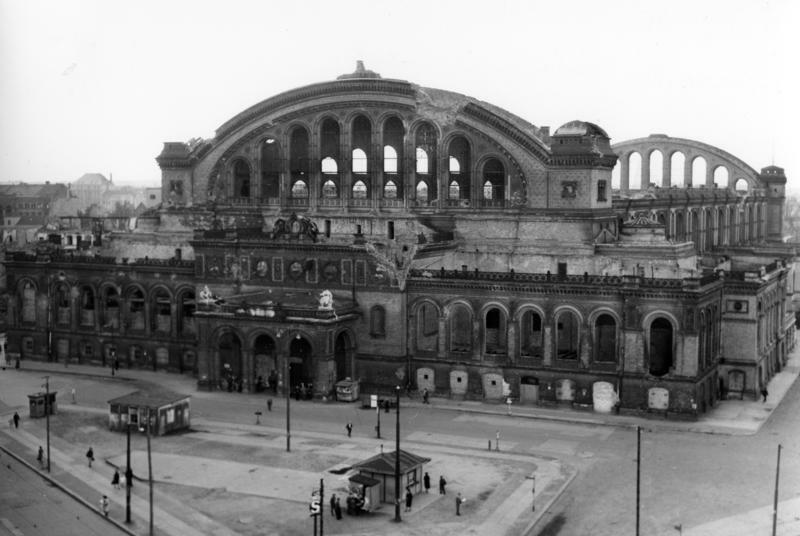 Anhalter Bahnhof was, in the time of Bismarck, the largest railway terminal in Continental Europe, linking Berlin to Frankfurt, Munich, Dresden, Prague, Vienna and Italy. 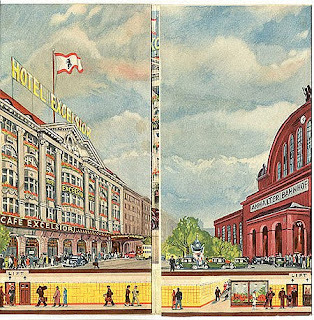 Like St Pancras, it had a grand hotel attached to it (the Excelsior) via an underground tunnel; and like St Pancras, it was an almighty piece of architecture, perhaps the most startling in scale that Berlin then possessed. Under the Nazis, thousands of Jews began their journey to the death camps from Anhalter Bahnhof. The deportations continued until March 1945. Nevertheless, Speer’s plans for Germania did not include Anhalter Bahnhof, which he planned to turn into a massive swimming pool. In the end, the station, virtually destroyed by Allied bombs, clung on until 1960 when it was demolished, except for the facade which survives today next to an astroturf football pitch. Karl and Friedrich have been temporarily moved from the middle of the park on Karl Liebknecht Strasse, and are currently sheltered under some linden trees, protected by metal fences. It’s difficult to tell whether they’re pleased with this development or not. Engels has that look of a man who is constantly put upon – it looks like frequently sweeps his hands through his hair in frustration. 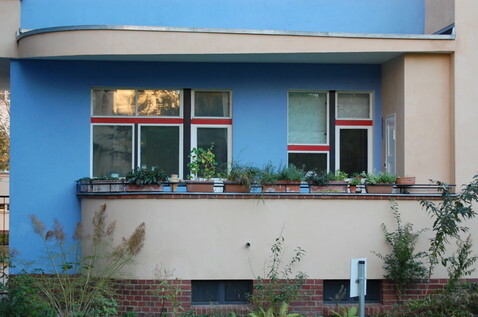 This is an original Bruno Taut siedlung – the Wohnstadt Carl Legien in Prenzlauer Berg. Taut was Weimar Germany’s answer to Berthold Lubetkin – defending his opulent housing for working people, he said "we want to bring the lower levels of society higher." Carl Legien was the first chairman of the German equivalent of the TUC, and the flats named in his honour are quietly lovely: colourful and oriented to their copious back gardens. It occurred to us that it rather strange that decent, artistically designed housing for the masses becomes a tourist attraction. Maybe it’s not really a tourist attraction, but it seems sadly part of another world when today’s governments are not interested in providing their people with good, secure places to live. An image from the East Side Gallery, the largest surviving portion of the wall, now covered with murals by artists from around the world. Ms Raspberry took this photo; I was in a mood that day. Peter Behrens’ mighty turbine hall for AEG. More of this later. Mies's Neue Nationalgalerie, with a reflection of the state library (the latter a far superior building to my mind than the former). I am NOT "the raspberry". I am "the beret".